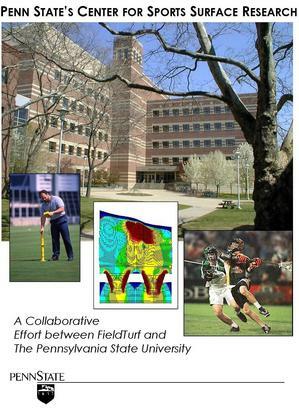 Penn State Turfgrass Science Projects' latest happenings! Penn State University and FieldTurf, the world leader in sports surfacing, have partnered to develop the world's first facility dedicated to sports surface research, with a five-year commitment that will center around research on synthetic turf, running tracks and indoor sports surfaces. This research collaboration is expected to further accelerate safety within the synthetic sports surfacing industry. The new Center for Sports Surface Research will be an intercollegiate program managed within the Department of Crop and Soil Sciences in Penn State's College of Agricultural Sciences and headed by Andrew McNitt, an associate professor of soil science. McNitt is regarded as a pioneer in the world of sports surface research, particularly as it relates to natural and synthetic turf, and conducts research relating to athletic field surface characterization and golf green construction and maintenance. He has been honored nationally by the Golf Course Superintendents Association of America, the Musser International Turfgrass Foundation, the Crop Science Society of America, the American Society of Agronomy, and the Sports Turf Managers Association. McNitt also currently serves as the technical advisor to the NFL Groundskeepers Association and is active with the Sports Turf Managers Association. A significant number of professional sports and collegiate groundskeepers are products of Penn State's prestigious turfgrass science department, which is considered one of the nation's finest. "Our partnership with Penn State brings the global synthetic turf leader together with the global research leader in all types of turf," said Joe Fields, chief executive officer of FieldTurf. "The original inspiration for FieldTurf was to provide a surface that would enable athletes to attain maximum performance while minimizing injuries, and we believe that this partnership will help ensure that we continue to lead our industry in developing surfaces that deliver unequaled performance and safety to the athletes that we serve." "Penn State is excited about the formalization of our research relationship with FieldTurf," said Bruce McPheron, dean of the College of Agricultural Sciences. "Together, I believe we can improve the safety of all those participating in recreational activities, from the occasional softball player and school-aged children in physical education classes to collegiate and professional athletes. FieldTurf's commitment to quality research is commendable and the college is looking forward to a productive future." In addition to McNitt's experience and body of work, the center will also incorporate the research endeavors of other Penn State faculty and students. "By combining the resources of Penn State's faculty, staff and students with the access to additional academic areas of the university for research, we expect to achieve an unprecedented opportunity and breeding ground to take developments within the artificial turf industry to an even higher and safer level," Fields said. FieldTurf is a global market leader in synthetic sports fields with more than 3,000 fields installed, along with pet, residential, commercial and municipal landscaping solutions, playground surfacing and golf and tennis products. FieldTurf is part of Tarkett Sports, the world's largest entity in the sports and landscape surfacing industries. Tarkett Sports manufactures a myriad of performance sports flooring products including synthetic and hardwood basketball, volleyball and gymnasium flooring; squash and racquetball courts; and the Beynon brand of high-performance indoor and outdoor running tracks. This page contains a single entry by ANDREW SCOTT MC NITT published on July 27, 2009 4:49 PM. Youngest Head Grounds Manager in MLB a Penn Stater was the previous entry in this blog. Penn State turfgrass alum grooms PGA Championship course is the next entry in this blog.